Parkour (AKA jumping and vaulting over walls, rails, etc.) being taught in Charlotte! Posted on 8 Jun 2012	by Steven James Erdmanczyk Jr. 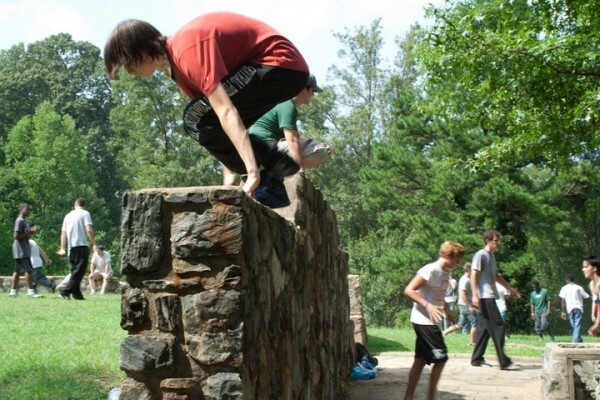 It was only six years ago when I first started training parkour here in Charlotte, my friends a year before me. There were no parkour gyms or coaches. Groups in America were only just beginning to form and it would be a couple years before the first parkour gym opened up in Colorado. Our sole resource was the internet, which was commonly how ‘traceurs’ (one who practices parkour) connected and met. With information being intermittent, learning for us involved a lot of trial and error. We, of course, started learning parkour because we saw the cool tricks in the videos and wanted to try them. We were soon to learn that there were no ‘tricks’ to parkour movements and it takes lots of hard work and conditioning if you want to be like the the impressive athletes we had come to known. Learning and progressing was more than just picking random things and jumping off of them. It was a discipline of figuring out “Ok, what am I capable of?”, “What do I want to be capable of?”, “So, if I want to do that, what movements and exercises should I do to train that ability and gain the necessary strength?.” There was a lot of physical conditioning involved to protect our joints from injury and over-use, and a lot of sore muscles. Through this process we learned how to strengthen our bodies while also garnering problem solving skills, getting a solid boost in self-esteem, and having loads of fun. Everyone who came out to train became an instant community of friends, there to help each other get stronger and progress. In the seven years since the first of our group began training in Charlotte, Parkour’s presence in the media has exploded. Even here in Charlotte our group has appeared on the news, first with WBTV in 2006, then Fox News in 2010, and WCNC just a few months ago. We’ve also been interviewed for articles in The Charlotte Observer and for an upcoming piece in the May issue of Speak Up Magazine. Across America and around the world communities, gyms, and businesses (profit and non-profit) have sprouted and grown. 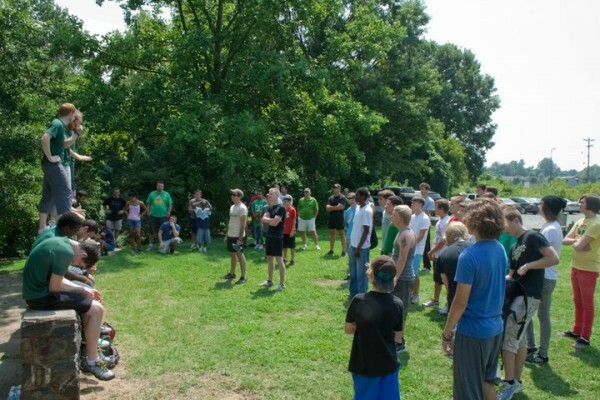 These groups are now using parkour as a vehicle to get adults and children back in shape, overcome fears and gain confidence, learn problem solving skills, find a positive outlet for energy, all while playing and having fun. Our group, Charlotte Parkour, is no exception. 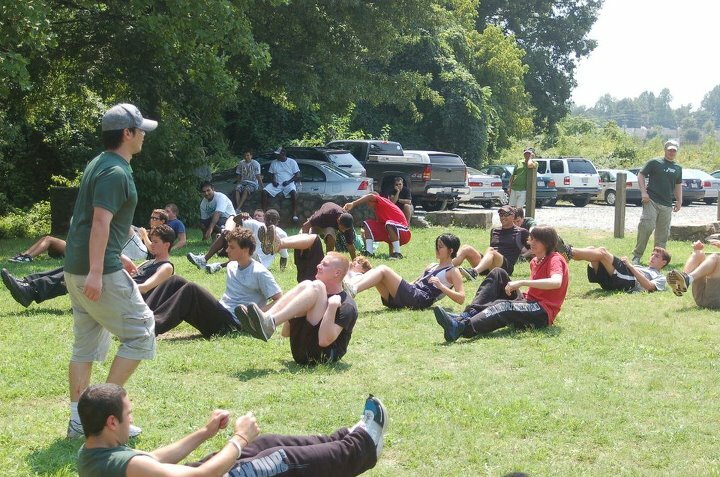 We want to give people in Charlotte the opportunity we didn’t have when we started and make sure people who want to learn parkour can learn it in a safe and effective manner. We also want to use parkour as a way to encourage people to get off the couch, be more active, stay healthy, and play. We offer this service through semi-regular seminars, classes, workshops, and a blog on our website. Our free parkour seminars are open to anyone who can come out. Our next will be on June 23rd, 2012 from 1pm-4pm at Bryant Neighborhood Park. All ages and experience levels are welcome; those with zero experience especially. For more info you can go to our seminar page. Our weekly class at Zenith Gymnastics Gym runs on Mondays from 8pm-9pm. This is the perfect opportunity for anyone who wants to try parkour but wants first hand coaching while starting off in an environment that’s more forgiving than concrete. Great for kids! For more information go to our class page. Also, besides public events and classes we do private workshops including sessions with Carmel Christian School, Davidson College students, the Queen City Young Active ProfessionalS meetup group, and recently students from Leadership Martial Arts Academy. Teaching is always loads of fun for us and the participants. Feel free to contact us via our e-mail if you’re interested in one for your group. Be sure to check out our website or facebook page for more information about us or parkour in general. Also, make sure to check out our regular blog with information pertaining to parkour and health and general.